Local Food Britain held its first Countryside Food Festival at Priory Farm in Surrey on Saturday September 15. More than 40 Local Food Britain members showcased their best food and drink offerings on the day. The sun shone as the crowds came in their thousands to Local Food Britain’s first ever Countryside Food Festival on Saturday September 15 held on Priory Farm’s picturesque Discovery Walk in Nutfield, Surrey. Families enjoyed a taste journey along the nature trail, sampling food and drink from artisan suppliers from across Surrey, and neighbouring counties. In scenes reminiscent of The Darling Buds of May, food lovers tasted local cheese, wine, beer, ciders, fudge, homemade preserves and much more – all produced by members of Local Food Britain – against a backdrop of fields of sunflowers, vintage tractors and straw bales. 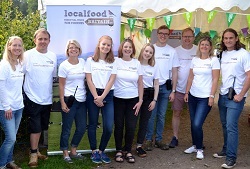 The rural event, which helped raise funds for Macmillan Cancer Support, was voted a huge success by Local Food Britain’s founder, Tracy Carroll. Children enjoyed cookery classes alongside their parents with chef and cookery tutor Laura Scott, while adults hopped aboard a vintage bus to listen to food talks and demonstrations from Local Food Britain experts, including Surrey’s Bake with Jack, who demonstrated his low-maintenance approach to making amazing sourdough bread. Visitors brought in bags full of apples to be pressed into juice by countryside manager and smallholder Andrew Wright, while others feasted on a three course firepit-cooked lunch from The Salt Box, set in a charming barn overlooking the lakes at Priory Farm. BBC Surrey and Sussex broadcast live from the event all day, and newsreader and Reigate resident Nicholas Owen popped in for a surprise visit in the afternoon. A delicious homemade piccalilli won the Preserves with Passion competition, which was judged at the festival. The winning preserve will be recreated and packaged as a limited-edition for Local Food Britain member Bartie’s Sussex Faire range, with all profits from its sale going to Macmillan Cancer Support.